Avira's solutions are regularly cited as reliable and efficient security tools, whether they are paid or free products. 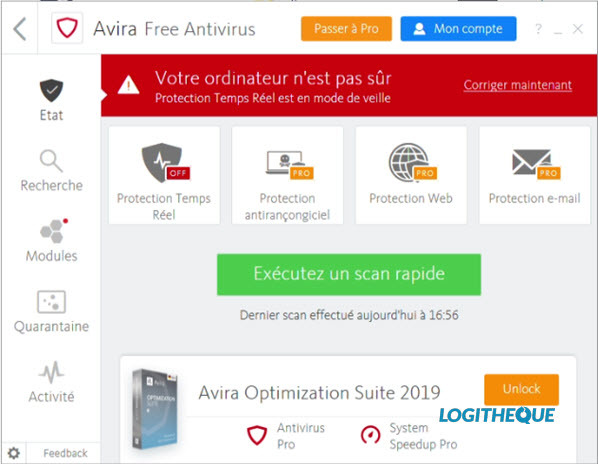 Last year, despite the lack of real new features, Avira Free Security Suite easily positioned itself among the best free solutions on the market. Will 2019 be a great year? 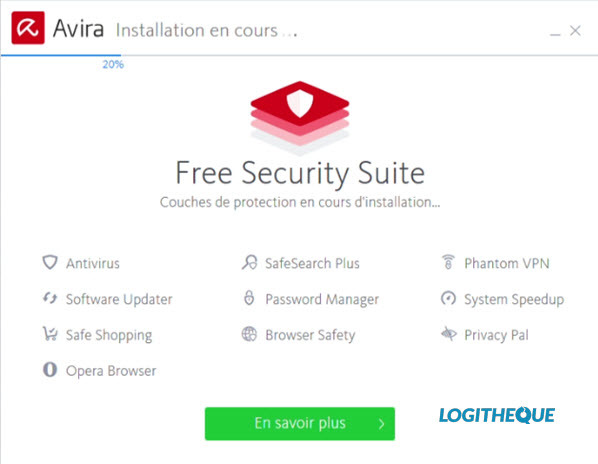 The installation system of Avira Free Security Suite has been slightly modified compared to last year. Indeed, it no longer allows you to choose the programs that will be installed. 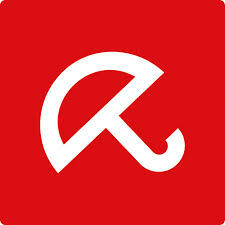 Avira is thus adopting the strategy of some of its competitors. The following is a list of default tools that can be uninstalled later. The editor still allows you to retrieve an offline installer for each software in the suite, but communicates mainly on its download tool which automatically retrieves the latest versions of the programs. Avira installs by default: Software Updater, Antivirus, Phantom VPN, System Speed up, Safe Shopping, Privacy Pal and Opera Browser. The installation of these programs goes smoothly. Other free tools are available (Home Guard, browser password manager, and web protection), but their installation must be started manually. The interface of the suite has hardly changed since its last major version. From the home page, the user can access all the tools. Everything is centralized there. The same is true for the main tool: antivirus. It always has a left pane with the menu and a home page with 4 essential features. Last year, we deplored the lack of clarity in the presentation of advanced antivirus settings. We make the same observation for this 2019 edition which presents a navigation that can be complicated for novice users. What is the antivirus worth? In its free version, Avira Antivirus does not offer anti-ransomware protection, web protection or e-mail protection. The user only benefits from the classic real-time protection. Not surprisingly, Avira detects that we handle malicious files as soon as our infected archive is unlocked. The program has been reactive. The same is true for its scanning capacity: the antivirus has detected all the malware in our sample of recent threats. With regard to the oldest threats, the software is, again, very reactive and manages to detect suspicious patterns quickly. Real-time protection is proven to be effective without significantly impacting the machine's resources. 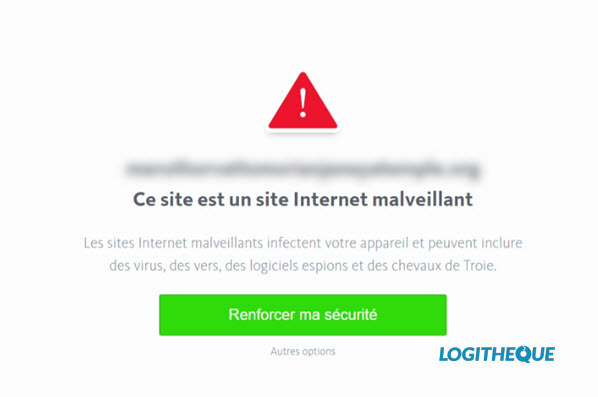 Note, however, that the software can be capricious if you are faced with a severe infection with several potentially dangerous viruses and software. Indeed, in extreme cases, the detection agent "Luke Filewalker from Avira" launches into several instances to analyze the machine. This allows the user to have several analysis windows on his screen. Maybe it's time for our old friend Filewalker to pass the torch, or for Avira to improve this aspect of the software. With regard to the duration of the analysis of the complete system, we did not find any abnormal phenomena. In terms of detection, Avira's engine shines, but we noticed that the software can take a long time to repair or remove malicious objects. Too bad. 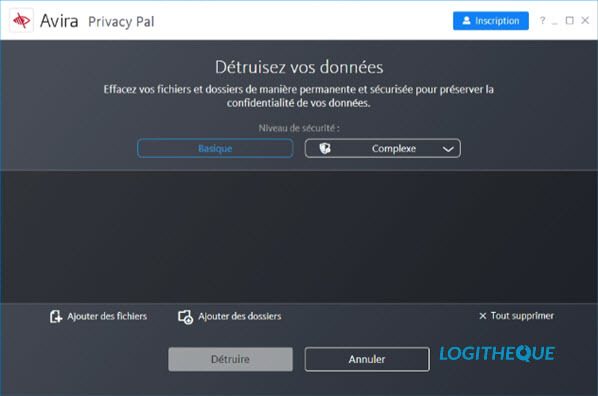 In reality, Privacy Pal is only a simple cleaning utility that allows you to delete certain browsing data (cookies, cache, history, entries), the history of the applications used and chat logs. If Avira's communication suggests that this is a kind of privacy shield, please be aware that this tool is not proactive and that it will have to be run manually on a regular basis to delete your usage data. Privacy Pal also includes a secure deletion module. This file shredder prevents the recovery of sensitive data after deletion. The other tools available last year have not changed either. A very slight graphical redesign has been done (change of the order of the menu items) in the Software Updater interface, but the functionalities remain the same. The tool will scan the system for drivers and obsolete software to update them. 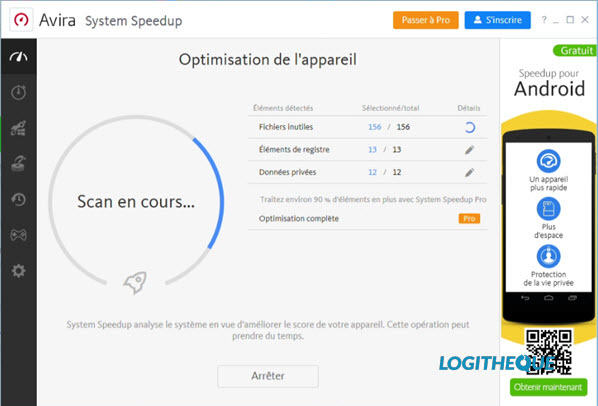 System Speed Up always allows you to control the cleaning of certain residual files. A "Game Booster" is also present. It "optimizes the system" for the execution of games. The tool will simply allocate more RAM to the game processes. In reality, if you have a high-performance machine, this solution will be of no use to you. All other interesting features of the tool are only available in the Pro version. While these paid functions benefit from a user-friendly interface that allows everyone to optimize their system with a single click, the vast majority of them are already integrated into Windows 10. The only real added value of System Speedup is therefore the centralization of all optimization functions. As last year, the Phantom VPN solution integrates Avira's free security suite by default. This is exactly the same software found in Avira Free Security Suite 2018. With its 500 MB of data/month, you won't go very far, but the tool offers many servers, which allows you to get an overview of its Pro version. Finally, let's talk about Opera, or rather the branded browser version "Avira Protected Browser". By default, the browser integrates Avira web protection and the password manager of the German publisher, apart from these two extensions, this is a classic version of Opera. The web protection offered is characterized by its ad blocker (Adguard), its anti-tracking device as well as the malicious link blocking system. This solution has proven effective when we have tried to visit potentially dangerous sites. Note that these modules are no longer part of Avira Safe Shopping, which becomes a simple price comparison tool. The password manager is identical to the previous edition and is an extension compatible with all major browsers. 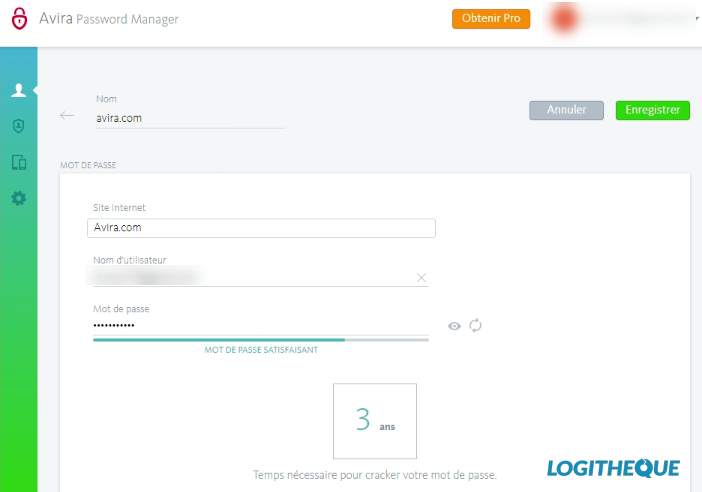 The tool still has its strong password generator and also has an alert system that alerts the user that their account has been hacked using the Have I Been Pwned service. 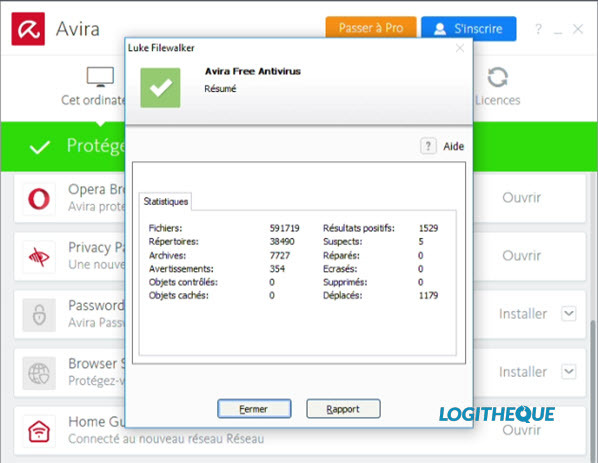 Avira's security suite includes reliable tools. 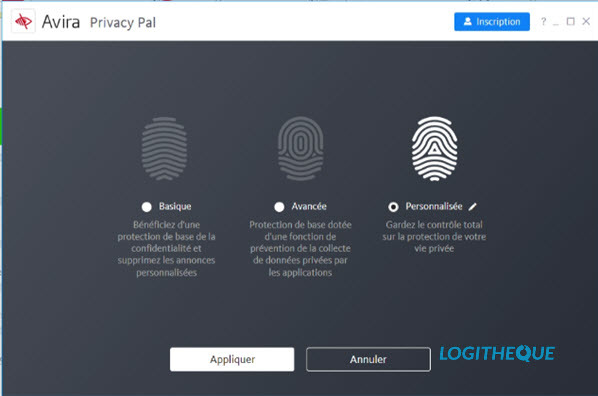 We welcome the arrival of Privacy Pal, but the addition of this feature is not enough to mask the lack of new features in Avira Free Security Suite. The publisher stands still and is satisfied with few improvements. However, let's admit that the rest is already very complete for a free solution. The daily performance of the antivirus is good despite the hazardous management of the scanning processes. The latter are likely to be very slow on very infected or old machines. 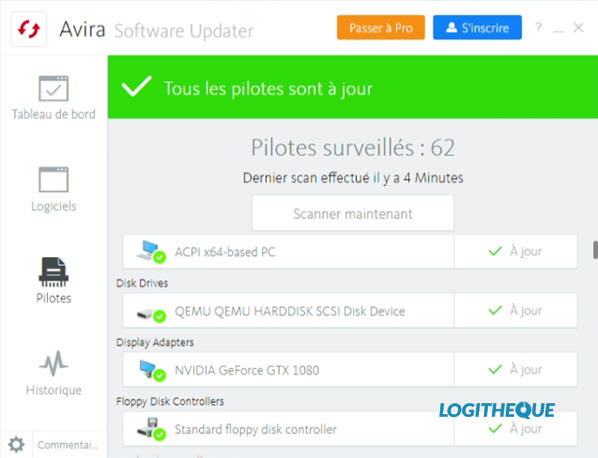 Finally, we regret the fact that it is no longer possible to choose the software to be installed when Avira is first launched. Despite these drawbacks, Avira Free Security Suite remains a key security tool for private individuals.